McCarthy Metal Roofing has launched a new website, packed with valuable new resources and detailed product information. Presented in an easy-to-navigate format, the site is designed to help educate homeowners about the benefits of metal roofing. Our mission is to help homeowners learn more about the benefits of metal roofing and to give them an opportunity to get to know us better. -Tim McCarthy- Founder and President of McCarthy Metal Roofing. 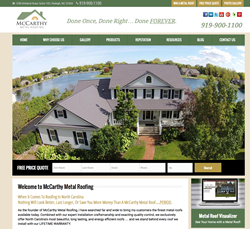 McCarthy Metal Roofing is excited to announce the launch of their new customer-friendly website. This new version provides site visitors with a simple and clean design that makes site navigation easy. -Tim McCarthy, Founder and President of McCarthy Metal Roofing. The new site was launched with new home owner resources that include content on the benefits and options for metal roofing. It also includes a Metal Roof Visualizer that enables homeowners to see what their new roof would look like on their existing home. Site visitors will also find an easier-to-use photo gallery, updated FAQs, information on easy financing solutions and a Free eBook ready for download. McCarthy Metal Roofing’s new website also showcases a blog designed to help keep customers up to date on company/industry news, home improvement tips, and product development insights.